How to play with 3 or 4 players? 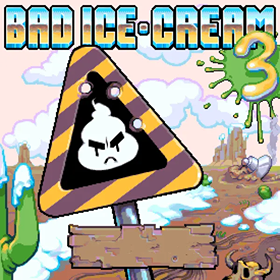 This is the first installment of series Bad Ice Cream games and it was released to players on December 11st, 2010. This game also has launched a version for both iPhone and Android device on Nitrome Touchy on February 19th, 2013. In this game, the main mission of players is to collect all the fruit in each level while trying to avoid enemies. A special feature of this game is that it allows up to 4 players to play, co-operate, and compete together on only one computer. In order to learn more about this game, let's move to the next sections below! Normally, there are at least two types of fruit to collect in each level and some fruits act a bit differently than others. As mentioned above, there are various types of fruit in this game and players must collect all of them to complete each level. An interesting point is that each type of fruit has its own sort of personality. Most of them remain stationary until they are picked up. However, there are some special fruits, they are able to move around. Some of them even run very quick. Stationary fruits: These fruits include Bananas, Grapes, Watermelons, Lemons, and Oranges. Moveable fruits: Kiwifruits, Strawberries, Pineapples, Pears, and Cherries. In which, Kiwifruits move slowly and very easy to capture; Strawberries also move slowly but are a bit faster than Kiwifruit; Pineapples are faster than strawberries and able to fly over walls to avoid being frozen; Pears are the fruit that is very difficult to capture because their speed is very fast; and finally, Cherry is the most difficult fruit to capture because they can disappear and teleport to a random location. Hot tiles: The hot tile can melt your ice. Arrow tiles: These items can change the direction of ice blocks that you create. Campfires: This is a dangerous item because it can melt your ice cream. In order to avoid them, you can freeze them with ice. However, this solution just can help you to last the time in a few seconds because after breaking the ice, the campfire starts burning again. Invisible tiles: Your ice cream can't go through invisible tiles but your enemies and fruits can. So, be careful with these tiles. Enemies appear on every level of this game and they try to flatten your ice cream character. There are various types of enemy in this game and each of them has its own unique abilities. You can't defeat these enemies, however, you can trap them by the ice, make them turn around or slow down them. Enemies in this game include Green troll, Black & white cows, Orange squid, Pot creature, Log man, Green squid, Blue cows, Ducks, Jumping ball towers, Blue squid, and Yellow cows. Player 1: Use the arrow keys to move and spacebar to break or create ice. Player 2: Use buttons W-A-S-D to move and button F to break or create ice. Play 3: Use buttons I-J-K-L to move and button U to break or create ice. Play 4: Use buttons 8-4-5-6 to move and button 1 to break or create ice. You are able to pause the game, turn the music on or off by pressing setting buttons on the game screen. Let's think before breaking the ice to create a way that can help you pick up fruit without meeting enemies. The best strategy to capture cherries is to freeze them before catching. You can create the ice to prevent enemies from approaching you. We can't deny that Bad Ice Cream is an excellent game. It is the best game of Nitrome with an addictive and challenging gameplay, cute cheerful pixel graphics, and chirpy music. Provide users with all of these prominent features, it is not difficult to understand the reason why this game is so popular and very well received as you can see. The fact that it always receives a very high rated from players on most gaming sites. Besides that, the feature that allows players to play, co-operate, and compete directly with friends on only one computer makes this game attracts a huge number of young users especially students. Of course, playing games with friends will bring us much more interesting experiences. So, lots of people are looking for Bad Ice Cream unblock game to enjoy this game with their friend at school or workplace - where the normal game versions are blocked. If you're also one of them, you are in right place. Here, we offer you this game with the unblocked version for free, so, you can access and enjoy it anywhere you want. Moreover, we also offer all the sequel of this game and all of them are not blocked. Now, all the necessary things are in your hand. Let's call your friends and enjoy this game with them. Good luck! Bad Ice Cream is an interesting game to play with friends. This game allows up to 4 players. In order to activate the four-player mode, you need to press button 1 in the character selection screen. The fourth player will move his/her ice cream character by pressing buttons 8-4-5-6 and use the button 1 to break ice.